Take the Mackeyville exit off Rt 220. Pine Creek Structures will on the your left. Questions about our inventory or sales? Call us at 570-726-8010 or stop by the store! Our stock lot is always open to browse! Check out the Information Shed for brochures and pricing on all our products. 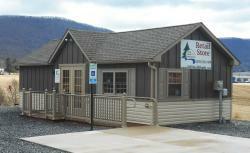 Also visit our new display lot on Route 220, next to Henry's BBQ (with limited office hours). payment and low monthly payments! In Stock or Custom Made! animal shelters to commercial portables and more! 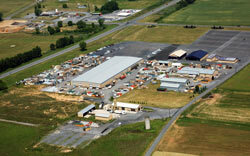 The Mill Hall Lot has TONS of inventory! See our stock structures below, or come visit us in person. 24 x 28 White Deer Cabin 25434 not on Mill Hall display lot .